What’s It About? Wes Anderson’s newest film is a brilliant mix of murder mystery and comedy with heart-warming undertones, and tells the tale of the friendship between the last concierge of the Grand Budapest Hotel and his lobby boy. Verdict: With its exterior walls in different shades of pink, its great white windows, and turrets set against a backdrop of snow-capped mountains, The Grand Budapest Hotel looks like it just popped out of a story book – but that’s the point. It is a hotel from a story book and that’s exactly what director Wes Anderson is aiming for as he sets out to tell a tale inside a tale inside another tale. The concept of the film might seem complex at first, yet it’s not hard to grasp once you start watching. The film follows the structure of a novel, including everything from a prologue to chapters, bringing the movie together in various episodes. The Grand Budapest Hotel starts with a girl admiringly opening a book by some celebrated author or other in the fictional and remote Eastern European republic of Zubrowka. Although originally inspired by the works of Swiss writer Stefan Zweig, who became more popular internationally over the last couple of years, the film simply refers to its storyteller as ‘author’. As the girl starts reading the prologue the story starts to come alive: first with the old author explaining how the story came to him rather than him having to search for it, then looking back onto his young self visiting a run-down Grand Budapest long after its days of glory. The young author is played by a brisk and curious Jude Law, who wants to delve into the history of the hotel. Meeting the melancholic owner of the hotel played by F. Abraham Murray, he soon finds out the whole truth over a glass of fine wine at dinner. Once the hotel’s owner starts to remember his past, the frame of the film changes from widescreen format to Academy ratio and the real adventure starts. The viewer is taken back to the great days of the Grand Budapest and gets to know the real heroes of the story, concierge Gustave H (Ralph Fiennes) and his admiring lobby boy Zero (Tony Revolori). The pace picks up when one of his clients, an elderly lady (Tilda Swinton), is murdered and leaves Gustave H one of her most precious and valuable paintings entitled ‘Boy With Apple’. This sets the ball rolling as Gustave H nicks the painting without further ado. While the murder of the lady is still being investigated, this results in a wild chase, prison break-outs and even races on skis and sleds. Viewers are kept on their toes, immersed in the wonderful world of Wes Anderson, right up to the end when the story finishes and the girl reading the novel closes her book. 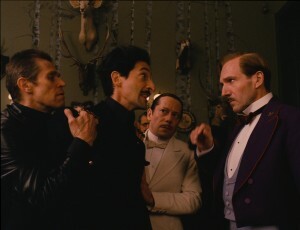 Ralph Fiennes gives a brilliant performance as Gustave H, the ever charming concierge who’s as witty as he is brave. Ready to fight for what’s right and admit his own faults, Gustave and Zero make an unlikely match. Zero, played by Tony Revolori making his film debut, is a shy character at first, but as the story progresses he starts to shine more and more, winning the audience’s affection. Then there’s Saoirse Ronan as Agatha. When she rides her bike along the snowy village streets, balancing pink pastry boxes on her shoulders and still looking elegant, it’s no wonder young Zero falls for her. Often found with flour on her cheeks and cream on her hands, she’s really found her calling in the world of cake-baking. Ronan manages to create a character as smart as she is gracious and is a worthy female role among all the male leads. Before she knows it, her character quickly becomes an accomplice in the art theft, as do many of the characters who are portrayed by an all-star cast. There’s Adrien Brody as the Tilda Swinton’s spoilt son, Willem Dafoe as a calculating killer, Edward Norton as an unwilling commander of what appears to be the equivalent of the SS, Lea Seydoux as a timid French maid, Bill Murray as another amusing concierge, and many more including cameos from Mathieu Almaric and Jeff Goldblum. A special mention should not only go to the cast, but to the production designer Adam Stockhausen, set decorator Anna Pinnock and costume designer Milena Canonero, whose incredible work makes The Grand Budapest Hotel what it is. From the magnificent halls with red carpets and delicate chandeliers to the violet uniforms of the lobby boys, the settings and costumes are where the real magic happens. Some of the crew had already worked with Wes Anderson on his Moonrise Kingdom, as had the French composer Alexandre Desplat. For The Grand Budapest Hotel, his beautiful score lifts the mood in funny moments and builds suspense for dangerous dilemmas. The music goes from cheeky little melodies using unusual instruments like balalaikas to full-on choral tunes brimming with deep voices. Final Words: All in all, The Grand Budapest Hotel may be one of the most wonderful films this year. Wes Anderson’s vision turns the story into yet another cinematic masterpiece, as wondrous and beautiful as its setting and as curious as its characters. The way Anderson brings to life Stefan Zweig’s story is nothing short of genius and the film will certainly charm viewers around the world. 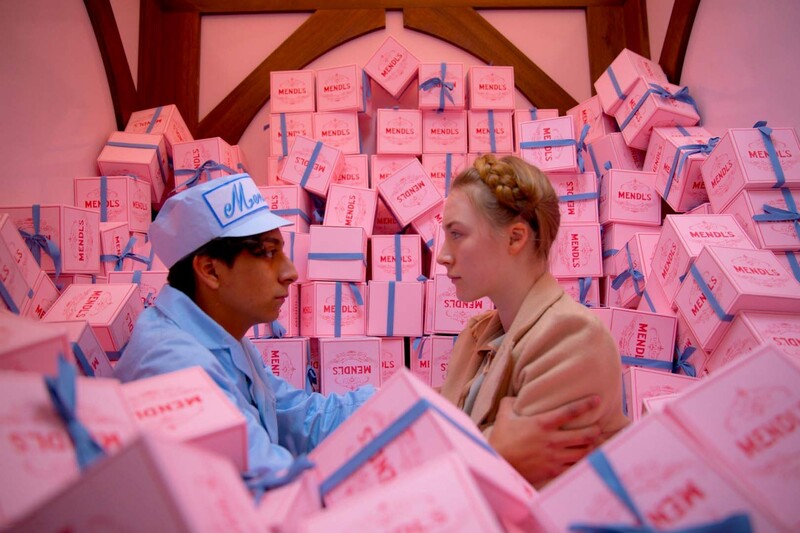 The Grand Budapest Hotel is released in UK cinemas on 7 March 2014.